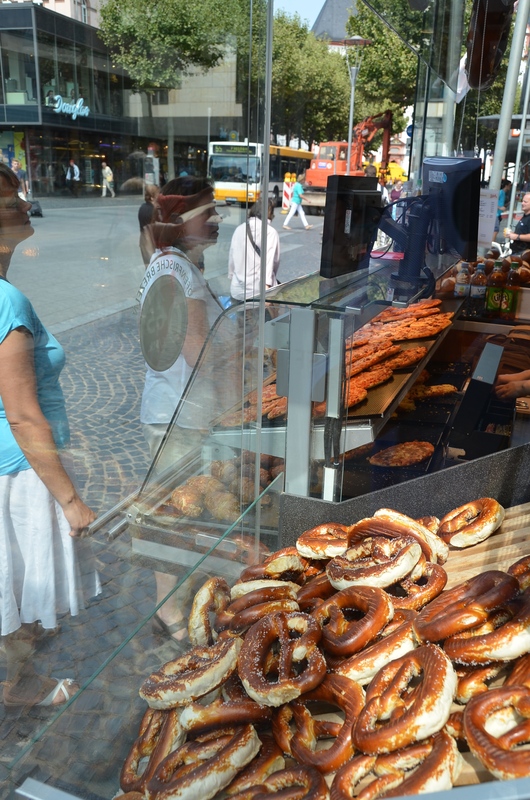 Despite the strong African influence on cuisine in Mainz – you’ll find Pizza Togo and Kaffee Togo on almost every corner – the classic has to be Ditsch’s Brezelbäckerei. The company was started by Heinrich Ditsch in 1919, passed on to his son Heinz (who introduced the Brezelmänner, white-coated chappies, going from wine bar to pub, selling soft brezeln from wicker baskets) and in turn to the current owner, Peter Ditsch, who extended the range to savoury pastry-based snacks, selling them from aesthetically simple kiosks that pump out hot brezeln by the ton. 01 Aug	This entry was published on 1 August, 2014 at 17:56 and is filed under Culinary, Mainz, Monthly Theme Day. Bookmark the permalink. Follow any comments here with the RSS feed for this post. Learn something new every day! Interesting. I would join the queue. I’ll try the pretzels as well as whatever is in the showcase!